This article was featured on the front page of the Wellness section on HuffPost. How often do you have the ability to completely shut yourself off from the world and do absolutely nothing but think? Arguably, there is only one time of day (or week if you’re the Burning Man-type, but no judgements here) that requires you to be completely alone with no distractions: shower time. This daily ritual is the one time that allows us to be completely uninterrupted by the hectic demands of our day. There are no amount of emails, calls, texts, DMs, tweets, or any other forms of communication that can reach you as you stand underneath the warm water cascading from a shower head. There are no requirements of you during this washing process ― even the most urgent of matters or persistent of people would not expect you to dive out of the shower and into the fray. For these reasons, the shower is quite literally a refuge. I’d be willing to say that in 99 percent of cases ― unless you are an unlucky woman staying in a creepy hotel in a Hitchcock film ― nobody is going to bother while you are in the shower. The moment you step out may be a different story, but while you’re standing naked behind the barrier of a plastic shower curtain, you can bet on a piece of time, however brief, to be totally uninterrupted. That’s why I believe the shower is without a doubt the most creative place there is. 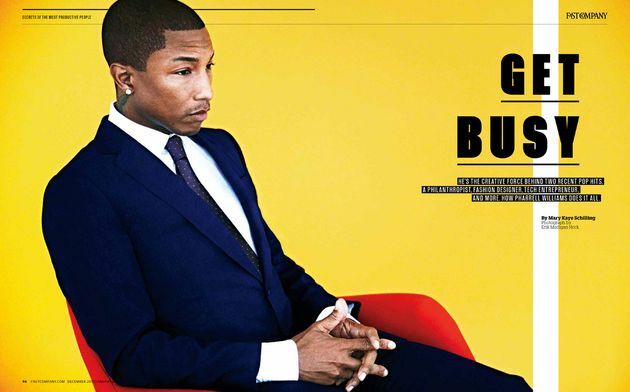 It wasn’t until much later that I came across another Pharrell interview, this time with Oprah, in which he revealed that some of his best verses and songs have come while in the shower. He attributed this to the “sensory deprivation” that comes from being audibly distracted by running water, which allows the mind to wander. The beauty of creativity is that it means different things for different people. With Pharrell being a sonic savant, it doesn’t surprise me one bit that his explanation of shower time creation revolves around the ear. As for me, a writer, the shower acts as a creative refuge for me not because of the soothing sound of rushing water, but because of the complete nothingness to be found there. The empty and unmarked space of a shower gives me the comfortable opportunity to do absolutely nothing other than the one thing that spurs creative problem solving: think. There are no judgments, and there are no distractions. There are no errands to interrupt my stream of consciousness or trending Facebook posts to pull me away from my Word document. I am free to let any and all ideas float by, and to entertain them for as long as they need. When you are consumed by falling water and rising steam, a whole new realm can open up inside your mind. In the shower, there is nothing to do but let your thoughts dance along the blank tile; it is as much a blank canvas for your mind as it is a place for good hygiene. If you’ve read my work, you know I’m all about applying creative truths to better understanding and channeling inspiration, so let me pose this question: how can creative minds benefit from this process of sanctified showerdom? Much like channeling creativity, the methods will be different for each person. But for me, I am sure to keep my phone on the ledge next to my shower so I can type notes the second I receive an idea, regardless of if I have a foaming head of shampoo or a mouth full of toothpaste. Just the other day I forgot to properly place my electronic idea-keeping device on this ledge while showering, which resulted in me yelling to my wife to bring it over as soon as possible so I could type some words down before they escaped. Since taking the practice of shower inspiration seriously, I wondered if there were better methods of recording ideas than leaning out of the shower curtain to dry my hands before typing on my non-waterproof iPhone. It was then that I learned of a company called Aqua Notes that makes waterproof notepads that allow you to jot down your ideas as your shower head continues to rain inspiration upon you. The fact that this nifty little invention even exists only further proves that others regard the shower as a creative sanctuary as well. Don’t take your shower time for granted. (Note: I have not tried bathing ― the shower’s outdated cousin ― to see if it is as equally accommodating to the creative mind, but something tells me that it is probably more relaxing than stimulating, likely to make you drift off to sleep rather than to a fantasy land of boundless creativity. Just my assumption.) Don’t let a new bottle of body wash be the only thing that sweeps you away while showering. Value the fact that you will not be bothered for the next however-many minutes, and let your mind roam free. If you’re doing it right, that shower head above you may very well turn into a light bulb. Robbie Tripp is the author of “Create Rebellion,” an abstract manifesto for disruptive creativity. He lives in San Francisco with his beautiful wife Sarah.